It was a nice, beautiful and sunny day in 1995 when a young boy named Sergey Brin met for the first time the man, who would later become his business partner – Larry Page. This happened at the Standford University and they quickly found that they have many common interests. Sergey had the task to show Larry around, who was a new student there. During their very first meeting, they didn’t stop arguing on every single topic they talked about. They had the opposite opinion on almost everything! Nobody would ever suggest, that these two rumbling guys would later create one of the most powerful and famous sites in the world – Google.com. None of the two students had even an idea about what their friendship would lead to. One of the school projects they worked on was called “Stanford Digital Library Project“, or just SDLP, which main purpose was the development of a universal digital library. For this to be achieved, they needed an application that could collect information about all pages and sites on the Internet and classify them according to specific criteria. So, in 1996 they launched their first algorithm for crawling the web called BackRub. It started to collect tons of information, but there was a need of classifying it. Larry then thought that the more links to a certain page, the more important it might be for people. The first system for measuring the importance of web pages was based exactly on this proposal and it was called “Page Rank“. This would later become the core of the Google Search Engine, still active and working today. One very interesting fact was that another search engine existed at the same time. It was called “RankDex” and it was based on nearly the same technology for evaluating web pages. It would be later become very popular, especially in China, under the name Baidu. Larry and Sergey‘s search engine was initially hosted on the server of The Stanford University. 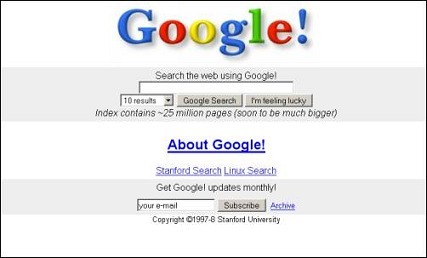 This is how the first version of Google was available at: google.stanford.edu. And things went well. The daily visitors of the site had been rapidly increasing with every single day. After a year, the school’s servers experienced heavy loads and were no more appropriate for the search engine. So, the two young entrepreneurs decided to move their search engine and start their own company. They decided to change the BackRub name and started brainstorming some different ideas. Finally, they picked “Googol”, that means a very large number – 1 with a hundred zeros. They registered the domain google.com on the 15th of September 1997 and started searching for financing for their idea. A curious fact is that this name was registered by a mistake, actually, Larry and Sergey wanted to get googol.com. So, they used the money from Andy to register and actually start the company. On the 7th of December, 1998 Google Inc. was incorporated. They rented an office – the garage of a friend of theirs in Menlo Park in California, which actually was the first office of the enterprise. At this time, around 10 000 searches were made daily with their new search engine. In the very next year, the company moved to a “real” office and the daily searches had increased to 500 000. This was the time, when Google received its second financial injection, this time for 25 million dollars. The funds were provided by Sequoia Capital and Kleiner Perking Caufield in exchange for a stake (not a steak). In the beginning of 2000, Google Inc had already 40 employees and it was working in several different languages. In October, the same year, the innovative advertising platform “Google Adwords” was started. It had 350 clients, who were benefiting from keyword targeted advertisements, and paying 0.05$ per for a click on their ads. The first talks for making the company publicly traded started in the beginning of 2003, but nothing happened. In 2004, Google Inc proudly announced, that they had hired the investment banks Morgan Stanley and Goldman Sachs to take care of the initial public offering – IPO – of the company. The management planned to sell shares for $4 000 000 000. On the 28th of April that same year, SEC (Security and Exchange Commission in the US) confirmed the prospect for collecting $2 718 281 828 through selling shares. This number is almost the same as the mathematical constant – e = 2,718281828… The actual IPO took place on the 28th of August, 2004, when 19 605 052 shares of Google Inc were sold to private investors. Every single share was traded at the price of $85, so the company managed to collect 1 670 000 000 US dollars. ($1.67 billion). Many of the Google’s employees already had shares and the price from the initial public offering made them millionaires overnight. In 2005, Google purchased Android Inc – the developer of the Android mobile operating system. Since the end of 2011, every single day more than 700 000 android phones have been activated every single day. If this continues, this operating system will turn into the leader in the mobile world (if it hasn’t become already). On October 10th, 2006 Google acquired YouTube, the most used video sharing platform. The price was only 1.65 million USD. Currently, as a part of its business strategy to search new markets, the search engine filters the results for the users in China. This is so, because they can be contrary to the government’s policy there. This allows the search engine there, but also shows how low the level of freedom there is. The company won the Prince of Austria’s Award for Communication and Humanities in 2008. Google is considered the best search engine in the history of the Internet as it allows millions of users worldwide to access the knowledge base and information quickly and find the best information and resources that they are looking for. Google announced on August 15th, 2011, that it acquired Motorola Mobility Holding, the manufacturer Motorola mobile phones, for a huge USD amount, in order to boost Android mobile devices and ensuring better client’s experience. Today, Google is the leading search engine in most of the countries around the world. The company is valued at 188 billion dollars according to the price of its shares – 579$ each (30.01.2012). It had nearly 37, 905 billion dollars of revenue and made $9,737 billion in profits. Google Adsense, Google Plus, Adwords, Analytics, Google Business Services, Translate, Blogger.com, Docs, Video – Youtube, Google Maps and Earth, the free mobile operating system – Android, Gmail, the browser Chrome, Google driving directions and many more. For a full list with all of them, you can check: http://en.wikipedia.org/wiki/List_of_Google_products. Please consider sharing this post with friends on the social networks, especially if you find it cool! This would be a great help for us. Thanks in advance!